Airplay in iPad 4.2.1 – It works! 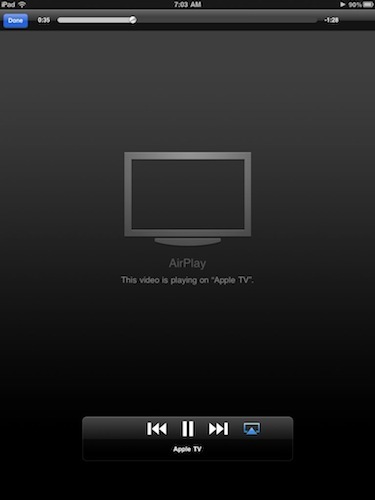 As promised, Airplay is now available in devices running iOS4.2.1, iPads and iPhones. Airplay streams movies and music from your iPad through the new Apple TV. Movies will show on the TV screen and music will play out through the TV or attached speakers. It does not ‘stream’ to your Mac though. 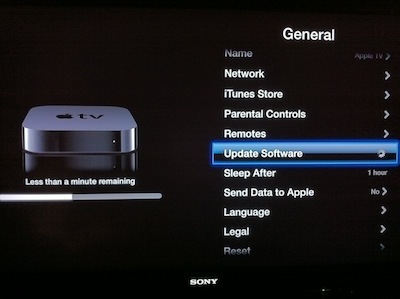 First, you need to get the AppleTV updated. From the menus, go to the far right and and choose to ‘Update Software’. Wanting to have iPad movie streaming joy, this line took a long time (not really, just seems like it) to move as the Apple TV updated. Just like updating the iPad with 4.2.1, we were all just over anxious tapping our fingers on the desk. Once the Apple TV is back up and running with the new OS, you do not need to go to any settings to accept a movie or song streamed from the iPad. 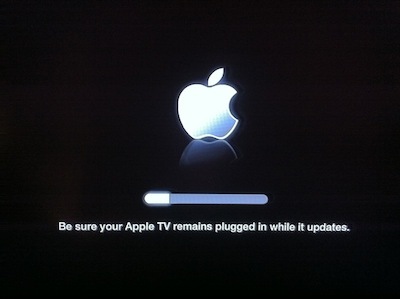 It isn’t like renting a movie, just the fact the Apple TV is on, it’s looking to accept the stream. From you iPad’s ‘iPod’ app, you will have a new button at the top of the screen. Tapping the button, you have the option where the music will be heard. You can choose to move from one to another while a song is playing or before you start. The music will continue playing/streaming when you move to other apps. That other new feature for the iPad… multitasking! Going to the ‘Videos’ app, nothing will appear different till you launch a movie. 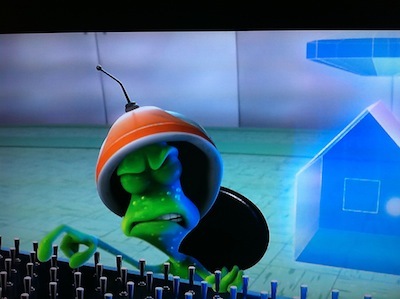 Once the movie is showing, the new Airplay button is located next to the ‘Jump to the end’ arrows. Like with the music, you can move back and forth between the movie playing on the iPad and streaming at any time. The below screen shows a movie being streamed where the controls are done still via the iPad screen. Multitasking works for movie streaming too. Yea… our little buddy shows on the TV. This was played to the masses in the room, right after we went through the many sports and tech video bits we all had. Now, all those movies you have moved to your iPad can be enjoyed on the big screen, by everyone in the room.